This was the derelict site next to Vauxhall Bridge now occupied by MI6, but then a playground for kids, and with some evidence of adult nocturnal activity scattered liberally around. At right is Camelford House, designed by TP Bennett and built in 1960 for the General Post Office's Telecommunications regional head office. Both it and the neighbouring Tintagel House built at the same time for the Metropolitan Police are among the better examples of their time, though that isn't saying a lot. Camelford House now houses a wide variety of organisations. 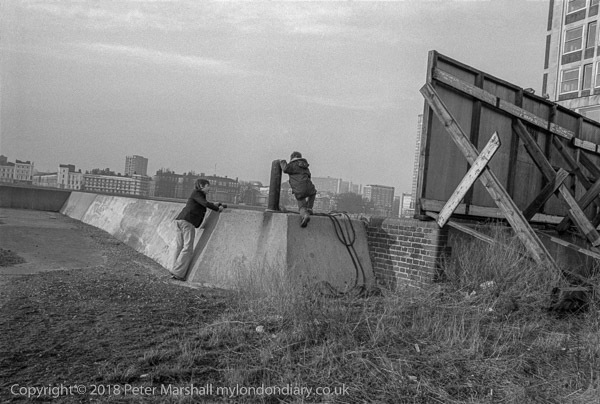 The concrete river wall was to the slipway which still exists and down which the London 'Duck' tours by amphibious vehicles enter and leave the river until the service was stopped to build the super-sewer project.